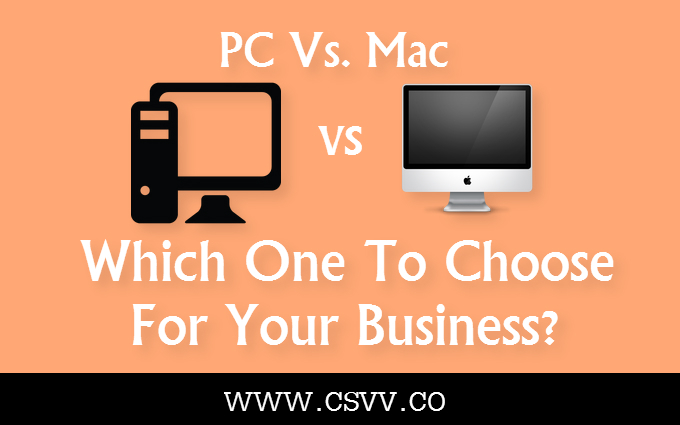 PC Vs. Mac – Which One To Choose For Your Business? When it comes to operating a business, people have to use a computer to make things much simpler than ever before. In fact, you can seldom think about a company where computers are not used at all. If you visit a few local stores, you will come to know that different people prefer to use different types of computers made by different companies. Two of the primary types include PC and Mac. It has been a long time debate over which computer to use for a business. Different people have different views. Some prefer to use a PC, whereas, others like to go for a Mac. Which one is indeed better, is still a tough question to answer. Are you thinking which machine to use for your business? PC and Mac have been compared on 5 primary areas to help you decide upon the best as per your needs. It is a known fact that in terms of price, a Mac scores way higher than a PC. If you look at the price of the cheapest PC and the cheapest Mac side by side, you will notice that the Mac is way costlier than the PC. At the same time, you may come up with the argument that the features of the cheapest Mac are much higher than the cheapest PC. Although a tablet may be more efficient than a PC, it may prove to be a major problem if your business requires lots of typing on a daily basis. Since the purchase price of a Mac is costlier than a PC, this is why most of the companies hire an iMac rather than buy new units, especially if they need it for a few days only. When it comes to investing in a computer in your own business, you should always opt for the one which is more reliable. It has been seen that the reliability factor, a Mac score higher than a PC. Apple, the creator of Mac, has received 78% scores when compared with the mere 59% for PC manufacturing companies such as Lenovo and Dell. It is good for you to note that Apple makes its own hardware, as well as, its own operating system. This means that their software and hardware are easily compatible with each other. On the other hand, PC manufacturers build their own hardware and install Windows, which is made by Microsoft. It has been seen that almost half the population in UK use iPhones. It is needless to say that iPhones, Macs and iPads will easily sync with each other. This proves that if your company uses Mac machines, almost half the employees can easily make the full use of various remote features, which includes the iCloud. However, it is also good to know that you can easily access Google’s cloud system from any device, whereas, Apple’s iCloud is only accessible from an Apple product. You will often hear people complaining about the fact that switching from a PC to a MAC and vice versa is a very tough job. However, there are still large fractions who find these transitions very simple. The delete function in a Mac is as simple as pressing the delete button, whereas, on a PC you have a follow a cumbersome path in order to delete a program. When it comes to virus attacks, Macs are much safer than PCs. The latter has a greater market share, due to which hackers develop viruses aimed at PC users. However, it does not mean that your Mac is 100% safe. Experts still suggest Mac users to use a suitable antivirus in order to stay away from online trouble. This is yet another reason behind the growing number of people preferring to hire an iMac Home bush than a PC. It can be safely said that both Macs and PCs are good to be used for your business. However, which one to choose is completely based upon your preferences. Take your time and make the right decision so that you do not have to regret in the long run. However, it can be said that in some cases a Mac has a slight edge over a PC.